We are also very proud of our Girls Soccer Team. They missed a win over St. Joe Monday afternoon by 1, but worked super hard! Fillies Soccer Game at home against Indianola today at 4:00. Fillies Softball Game against Magnolia Heights at home today 4:00. Come out and support the ALL the Lee Fillies! High School football game here Friday night at 7:30 vs North Delta. This is "Green Out" Game. FANS WEAR GREEN! Punt, Pass, & Kick (sponsored by the Lee Senior Class) - for all boys in grades K3-6 starts at 5:30 Friday night on the field! It's not too late to register! Drop your child's form by the Lee office by Thursday. Colt Cuties and Future Colts are invited to participate Friday night. Be on the sidelines by 7:20 to line up. This will be the last game they will be participating in this season! 2nd Half- Lisa Rhoden, Bill Strohm, Shelia Strohm, Shelia Riddick, Robbie Riddick, Kristi Byrd. We need one more worker for the second half of the game this Friday. We also need workers for High School Games on 10/7 and 10/14. 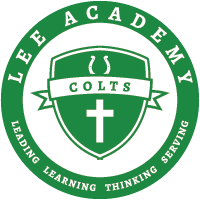 Contact Raychel Lunceford at Lee 627-7891 or rlunceford@leeacademycolts.org if you can help. Are you an artist? Create a design for Lee's 2016 Homecoming t shirt. The winning designer will earn a point for their class for the Homecoming Competition. See Miss Butler for details.